I started out writing this article for Mikaela all about story telling, and how story telling is super big in the world of business these days. And we all better get out there and make our stories sing. It’s like everyone from corporate giants to a fledging handmade business must have some kind of amazing story and compelling ‘why’ that fuels their business dreams. But I know that not everyone has this compelling ‘why’ that drives their business. We aren’t all directing 100% of our profits back to poverty reduction programs or disrupting global giants with an amazing new app from Silicon Valley. Not everyone had a life-altering event, which kick-started their business dreams. Do you feel like your story is not quite big enough or special enough? Handmade and creative businesses are started for a range of reasons. You searched for months and couldn’t find the right supplies, and thought that others might want to buy something different too. Your friends and family adored your creations, and a glimmer of hope was born that maybe, just, maybe there might be a way to make money doing something you love. It’s your passion, your creative passion. You’re driven to create. This is what you studied for years. This is what you think about all the time. Maybe, after the children were born you just couldn’t go into the office again and wanted to find a more flexible way of working. A business of your own looked like it could do that. These are the other real life reasons that people start businesses. 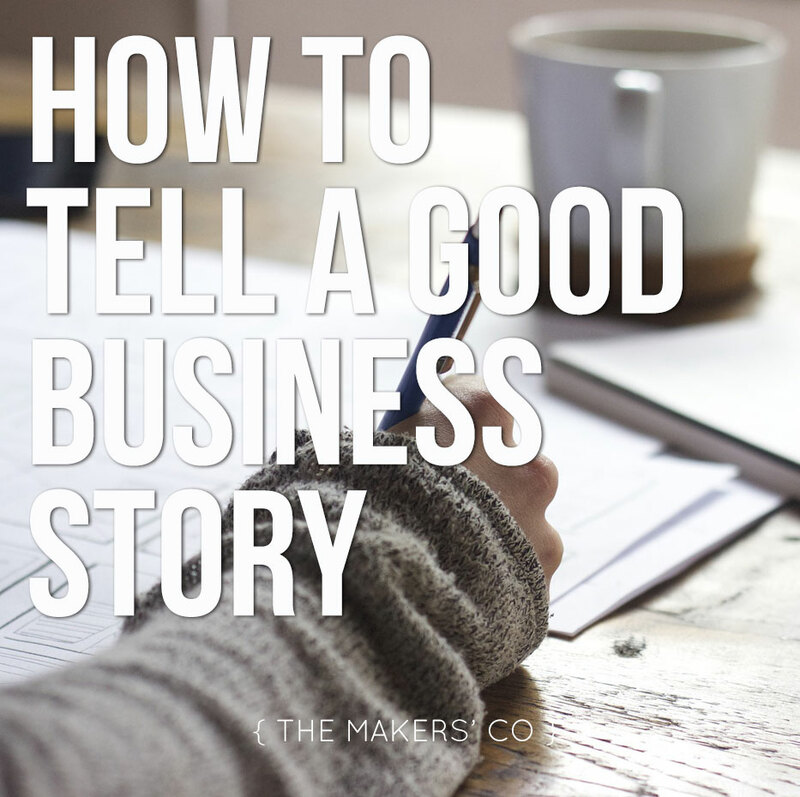 But do they make a good story for your business? 1. You write the story for the audience. Your customers I hear you all say. That’s pretty obvious. Let’s move on. I want a bit more detail. I want to know customer names, age, socio-economic demographics… all the usual marketing information. But I also want to know why they buy from you. What are the top three reasons they buy? We need real data here. You need to deeply know your customers and why they buy. Talk to them as much as possible and find out why they buy. Collect data through simple questions on your website. Start an email discussion with clients when they buy. Write it all down and put it all in the one place. 2. You know who you are. Every business has a style that influences everything you do. This is more than logos, colours and font choice. This is about who you are and where you’re positioning yourself. Are you a contemporary quilter selling innovative fabric designs to other quilters? Are you a pen and ink illustrator with a quirky sense of humour? The words you choose to describe yourself are the signals to others about who you are, and who you are not. 3. You know what your key messages are, and you stick with them. So often I see ‘About Pages’ which list everything about that person. They include every job, every hobby, and every step along the way between idea and business launch. Unless it’s seriously and directly relevant to the customers you serve right now, leave it out. The problem with too much detail is that your visitor gets overwhelmed and forgets that you’re the illustrator with the great one-liners. Talk about those things that matter to your customers: where you get your inspiration from or how they can use your creations. Don’t give them diversions from the main message: like the job you had ten years ago if it’s not relevant. 4. You make it easy to follow. Making it easy to follow and interesting is easier said than done. But that doesn’t make it any less critical. Not only must the business story you tell, be relevant to the customer it has to be easy to follow. Once you’ve written your story, have someone else look at it and ask them if your story comes across as interesting and logical. Get them to cross out anything that isn’t interesting. Or anything confusing that gets in the way of your key messages. 5. You tell it with relevant honesty. All good stories connect with honesty and this is the same for business stories. Your ‘why’ doesn’t have to be glamorous, disrupting or challenging. You don’t even need to include your ‘why’ in your business story unless it’s relevant to your customers. If you invented a super cool baby sling, because all the ones you could find when your baby was born left your shoulders in pain, that’s relevant to your story. It even sounds like it’s the key relevant message for your customers. But if you’re a high-end photographer with clients in executive business, telling them that you’ll be editing their portraits after the kids are in bed is not relevant. You do what you do, and you tell your story with honesty. I’m a content writer. I write stories – big, small and tiny – for people and organisations. You come to me to write your story when you just don’t have the time to do it. Or maybe you really don’t like talking about yourself, so it all just comes out …wrong. Some things you just outsource, because in the end it makes life easier and you get better results. Jen Forest is a freelance content writer. Since 2009, Jen has been helping you communicate your messages and get your story out there. Her clients have included businesses, museums, governments and not-for-profit organisations. You can find Jen Forest over at her business website Carrot Patch Content.